Data import is used when you want to work with tracks and points from external sources - websites, file folders, databases, applications, add-ons etc. This function is a general place where to start importing. Otherwise there are many other spots where the import can be launched from, depending on the content you want to import - points or tracks. When selecting the Data Import function, Locus Map opens a file manager window displaying three tabs where to choose files to import. Importable files are in full color and are clickable. More about supported formats see in points/tracks dedicated import chapters. 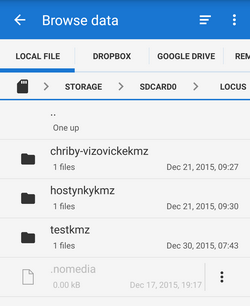 Local file tab - directory structure of your device memory. Importable files are usually stored in SDCARD folder. After selecting the file Locus Map analyses it and modifies the import dialog according to the content - the dialog can process points or tracks or both of them at once. After pushing the Import button the imported points appear in the selected folder of the Data manager Points tab, respectively tracks in the Tracks tab. 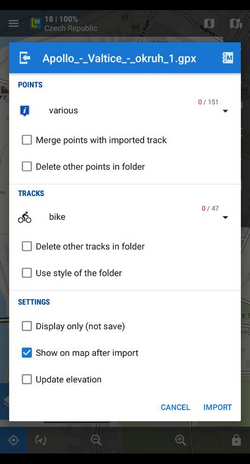 Depending on whether the option Display on the map after import was checked the imported data appear on the map as well.